Happy Easter Bank holiday everyone. I’m really excited to share with you the news that my ‘Chingri Maach – aka Bengali Prawn Curry’ is featured in the April edition of Delicious Magazine. So please go out and get your own copy so that sales for April sky rocket and Delicious Magazine want to feature me again ;o). It just so happens that the front of the magazine this month has my favourite cakes of all time – Portuguese custard tarts. They look so temptingly delicious that I will be trying to make them myself shortly. 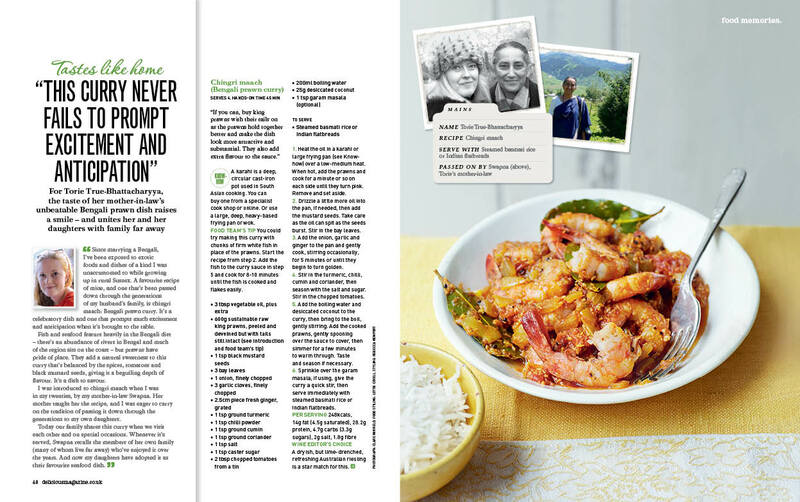 So what are you waiting for….go grab yourself a copy and do try my prawn curry. The background to the curry is explained in the article. If you are in the US/Canada/India/Australia/NZ etc…then perhaps you could leave me a comment below telling me which are your favourite Food/Lifestyle Magazines in your country so that I can get in contact with them for future features. This entry was posted in Press and tagged Delicious Magazine, india, Indian food, prawn curry, Press. Bookmark the permalink. My vote goes to Australian Gourmet Traveller…..